The landmark series seen on PBS. The Prize: The Epic Quest for Oil, Money, and Power (1991; ISBN 0671502484) is Daniel Yergin's 800-page history of the global oil industry from the 1850s through 1990. 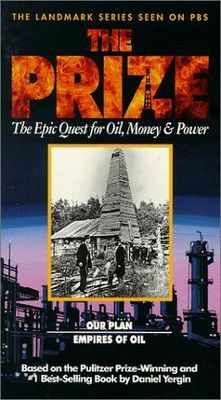 The Prize benefited from extraordinary timing: published in October 1990, two months after the invasion of Kuwait ordered by Saddam Hussein and three months before the U.S.-led coalition unleashed the Gulf War to oust Iraqi troops from that country, the book's theme of the historical centrality of what its subtitle calls "the epic quest for oil, money, and power" was in tune with the zeitgeist; the book became a number-one bestseller in the United States and won a Pulitzer Prize. Japan occupies Manchuria, 1931 (305). Ultranationalist militarists in power (306). Japan dependent on foreign oil, especially Rising Sun (Japanese affiliate of Royal Dutch/Shell) and Standard-Vacuum (Stanvac, an amalgam of Jersey and Standard of New York’s Far East operations) (307). 1934 Petroleum Industry Law squeezed companies (308). Japan attacks China, 1937; placates companies as U.S. public opinion sides with China (308-10). Stanvac resolved on embargo of Japan if U.S. so decides (310-11). U.S. moves fleet to Pearl Harbor and restricts (but does not stop) oil shipments to Japan, 1940 (311-13). Cordell Hull & Admiral Nomura converse repeatedly (313-14). Admiral Yamamoto sensitive to Japan’s oil predicament (314-16). Japan invades Indochina; U.S. effectively embargoes oil, July 1941 (316-19). P.M. Konoye-Roosevelt summit doesn’t come off (319-20). Japanese resolve on war (320-23). Operation Hawaii’s primary target is East Indian oilfields (325-26). Japanese err in failing to destroy 4,500,000 barrels (720,000 m³) of vulnerable U.S. oil supplies at Pearl Harbor (326-27). The PBS documentary film is an exciting and entertaining eight-part series, based on Daniel Yergin's Pulitzer Prize-winning book, captures the panoramic history of the biggest industry in the world. Shot on location in Azerbaijan, Egypt, England, Indonesia, Japan, Kuwait, Mexico, Russia, Scotland, Turkey, and the United States, the series features fascinating characters, archival footage, and interviews with the people who shaped the oil industry.